9:30pm | Kitchener Portuguese Club Inc.
Posted in: Past News and Events. Tagged: $10, $20, $25, $5 at the door, 2016, 27th, 6pm, 7pm, 9:30pm, Carnaval, Children, Dance, Dance Only, Dessert, dinner, Doors, February, Jose Lourenco, Members, Menu, Music, Non-Members, or, potatoes, Prices:, Reservations, salad, Saturday, Scallops, Soup, The One Man Show., Veal, Vitor Sebastiao. Menu: Soup, Salad, Veal Scallops with Potatoes and Dessert. Dance with “The One Man Show“ (Paulo Moreira). Posted in: Past News and Events. Tagged: $10, $20, $25, $5 at the door, 14th, 2015, 6pm, 7pm, 9:30pm, Atlantic DJ, Chestnuts, Children, clams, Cubbed, Dance, Dance Only, dinner, Doors, Lightened Wine, Meat, Members, Menu, Non-Members, November, pork, potatoes, Saturday, St. Martins, Supper. 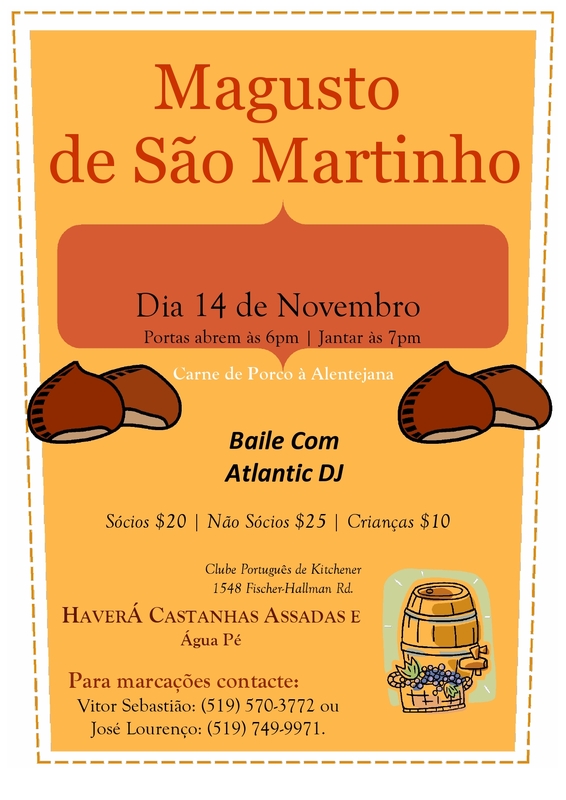 No Sabado, Dia 14 de Novembro, vai se realizar o Magusto de São Martinho, no Salão de festas do Clube Português de Kitchener. Ementa: Carne de Porco Alentejana. Para fazer as suas marcações, contactem: o Victor Sebastião: (519) 570-3772, Jose Lourenco: (519) 749-9971 ou o Clube: (519) 579-6960.